As the lifeguards drew near him the water about the man was suddenly tinged with red and he shrieked loudly. A woman on shore cried that the man in the red canoe had upset, but others realized it was blood that colored the water and the woman fainted. 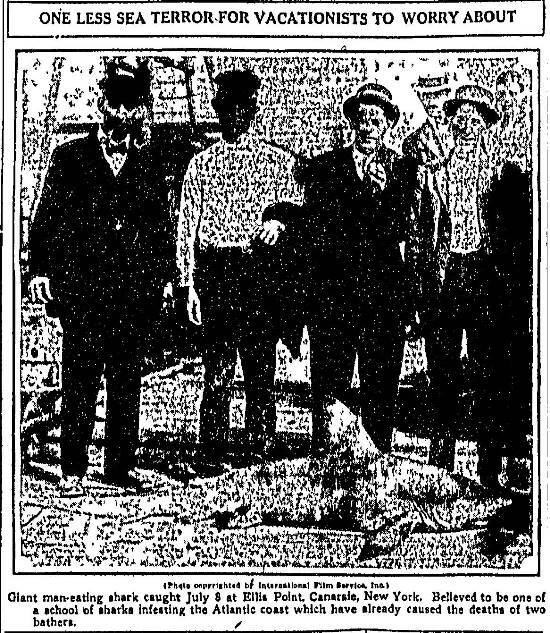 Charles Bruder, an employee of a Spring Haven, New Jersey resort, had just become the second victim in a series of shark attacks that plagued the Jersey shore in July 1916. Reflecting the widespread national coverage these local attacks received, Early American Newspapers contains rich cache of articles covering the terrible events of that summer. Charles E. Vansant, 23, son of a Philadelphia physician, was attacked by a shark or other big fish while bathing in the surf off here yesterday, according to eyewitnesses, and died before he could be rescued. Alexander Ott, an expert swimmer, who saw the encounter, rushed to Vansant’s assistance, but he was apparently dead when Ott reached him. There were wounds on Vansant’s legs showing he had been bitten. Those “experts” who are discussing Vansant’s death, which was caused by the bite of a shark, and pooh-poohing the idea of any further attacks, may be right for all we know, but there is the fact that Vansant was killed and the shark was not. They can’t get away from those two facts. The vicious fish bit off the young man’s right leg above the knee; his left foot below the ankle; cut a terrible gash in his abdomen, and cut his face. When first attacked Broder [sic] was floating on his back and joyfully calling to friends inside the bathing ropes. 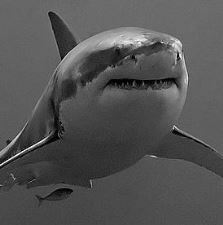 The shark was seen to dash in his direction, his fins showing above the surface of the water. Broder screamed so loud his calls for help were heard three blocks away and leaped from the water with his right leg gone from above the knee, and blood spurting from the wound. He fell back into the water, the shark made another attack, this time decapitating his left foot. Swimming away and darting forward again like an aeroplane attacking a Zeppelin, the shark made another lunge, cutting a deep gash in Broder’s abdomen. In the meantime the lifeguards had launched their boat and hundreds of people had gathered upon the beach. Still conscious and fighting bravely, Broder was able to place his hands on the gunwale of the boat and then collapsed. He was pulled into the craft bleeding from his wounds and died before the boat reached the shore. This is the first accident of its kind in the history of this fashionable resort. The Wilkes Barre Times Leader also reported on Bruder’s death, providing a record of his dying words which he used to give a detailed account of the shark attack. He was a big, gray fellow, and as rough as sandpaper. I didn’t see him until after he struck me the first time. He cut me here in the side, and his belly was so rough it bruised my face and arms. That was when I yelled the first time he snipped my left leg off there, only turned and shot back at me. That time, I thought he had gone on, but he [bit me] just below the knee. He yanked me clear under before he let go. I had hardly reached the surface when he came back at me again. That time he bit me here in the side, an awful blow, and he shook me like a terrier shakes a rat. But he let go while I was calling, then suddenly struck at me again and this time took off the other leg. He’s a big fellow and awful hungry. The ensuing media reaction to the second death in a week was predictable. …precautions against a repetition of the two tragedies were taken today at all bathing beaches. Motor boat patrols were established, the boats being equipped with rifles, harpoons and axes in case any sharks are encountered. The loud exhaust of the motor craft, it is expected, will be enough to frighten away any shark that approaches the shore. Close mesh nets of heavy wire are being used to enclose all the bathing grounds, and the lifeguards have been ordered to strictly enforce the rule against swimming out beyond the ropes. The nets are to be stretched from the sea bottom to the high water mark. Suggestion that New Jersey resort cities club together and hire professional shark catchers to land the man-eater that killed Charles Bruder at Spring Lake was agitated today. Resort cities fear a big drop in attendance. It was noted yesterday that few bathers at any of the Jersey outing cities ventured into the water, and this, despite the fact that at Spring Lake a volunteer motor boat patrol chugged back and forth hoping to scare the monster. One lone shark probably was responsible for the two killings off the Jersey coast, it was said at the United States Bureau of Fisheries today. The shark, the officials said, probably acquired a taste for human flesh because of the scarcity of food fish this season. The case is extremely unusual. I don’t look for it to happen again. The fact that only two out of millions of bathers have been attacked in many years is evidence of the rarity of such instances. Someone wants to know how to distinguish between a man-eating shark and the harmless species. That's easy. If it bites your leg off, it's a man-eating shark. 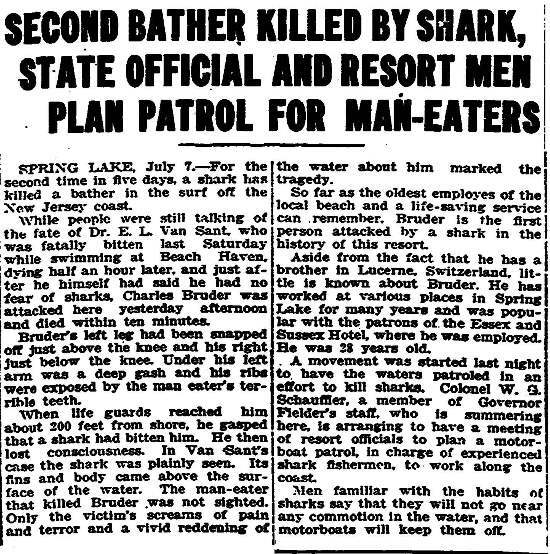 On July 12, just a week after Bruder’s death, The Evening Times printed an article titled “The Shark Peril” in which the danger of attack by a “ferocious and greedy fish” is compared to the many other hazards of recreating around water. …there is no one upon whom the shortcomings of carelessness takes a stronger hold than the person accustomed to find his pleasure around the water. The heedlessness of the boaters and the skater is proverbial, and canoeing is often practiced as a sort of lottery in suicide. The bather, too, has his share of foolish temerity, and the swimmer draws a false sense of security from his art and his muscles. It is not to construct a bogey to say that caution in entering deep water would be a healthy practice this summer. To keep out of the sea where a man-eating shark may be skulking is to be on the safe side in any case. Lester Stillwell, 12 years old, was killed by a man-eating shark while bathing in an arm of Raritan Bay near here this afternoon. Stanley Fisher, 24 years old, who went to his aid, was so badly injured in a desperate struggle with the nine-foot sea monster that he died while being taken to a Long Branch hospital. Joseph Dunn, 12 years old, bathing some distance away in the same inlet, was attacked by a shark and one of his legs was so lacerated it probably will have to be amputated. A monster shark, whose stomach contained part of a human body, was killed at Keyport, N.J. today, according to information received at the weather bureau here from the observer at Long Branch, N.J.
President Wilson and the members of his cabinet…discussed means of ridding the coast waters and beaches of man-eating sharks. As a result of the meeting, orders were issued later to the coast guard to assist in exterminating the sharks. 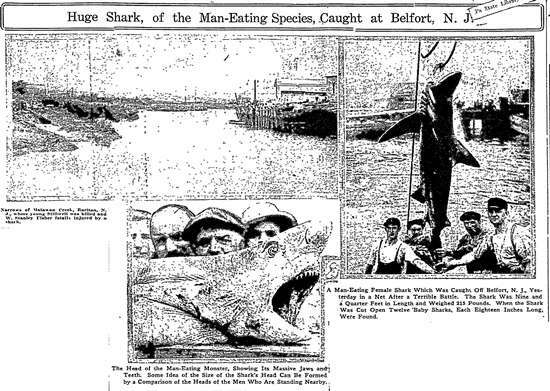 Stories about sharks remained in the newspapers for weeks following the deaths of Stillwell and Fisher; sightings of sharks, the status of the government patrols and their efforts to kill or capture the predators, and offers of rewards by local officials were all reported. Thankfully, however, the attacks in Matawan Creek marked the last incident of what has become known as the Jersey Shore shark attacks of 1916. It’s important to keep these incidents in perspective, so while on this summer’s trip to the shore, or sixteen miles upriver, keep in mind that some species of sharks live longer than 100 years.